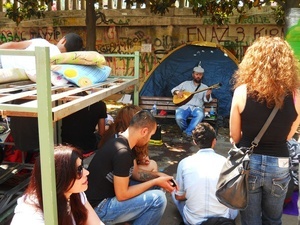 The camp at Taksim Gezi Park in Taksim Square, in Istanbul, Turkey, where plans to replace the park with a shopping mall sparked an uprising. Two young Irish journalists Ronan Burtenshaw and Tommy Gavin have been reporting from Istanbul for Rabble.ie since the protests began. Here, they recap the events of the past seven days and describe the animal-friendly life at the camp. 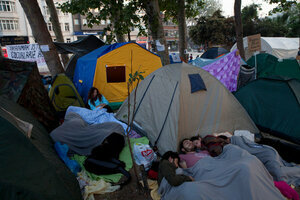 Until recently conversation in Gezi Park was focused on the trees. This is one of the few remaining green spaces in this city of fourteen million. Activists organised by Greenpeace had been camping there in rotation since December. They were there to prevent the government from following through on its plan to demolish the park and build a shopping mall in its place. When bulldozers arrived on May 29th and were followed on May 30th by the first in a series of brutal police crackdowns numbers grew to hundreds and then thousands. What began as a question of green space in a densely popukated urban area grew to a movement that gave expression to grievances with the conservatism, authoritarianism and neoliberalism of the AKP government. But until May 31 nobody really believed that the demolition of the park could be stopped. That morning police again raided the camp, using an egregious amount of tear gas in the commercial centre of the city. Worse still they herded demonstrators into Taksim metro station, firing gas cannisters after them and locking the doors. The attack caused the first of at least three deaths during the uprising, with thousands more injured. Public indignation at this violence saw Gezi become a symbol of resistance and the centre of a new anti-government movement. Saturday saw the first mass mobilisations – hundreds of thousands in Istanbul, where crowds marched from the Asian side at dawn, and over a million across Turkey. 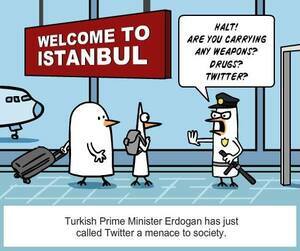 The size of the crowds on Saturday forced authorities to pull back from Taksim Square and Gezi Park that evening. Although clashes have continued at the fringes, and in close by flashpoints Besiktas and Gazi Mallehesi, the police have not returned to Taksim – which protestors have fortified with barricades. 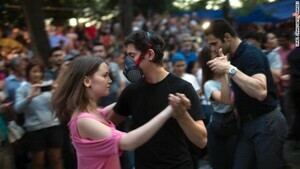 Today Gezi Park is liberated communal space. While Prime Minister Erdogan insists that it will be demolished and replaced with a shopping mall, protestors build structures for a long-term occupation. Thousands sleep there in tents every night amid a festive atmosphere. An ever-expanding supply centre manned by young volunteers distributes the donations – food, water, blankets, gas masks – which arrive every hour. Groups give their time to organise activities: comedy shows, yoga, volleyball matches, gardening, face-painting, a creche. There’s even a vet. A platform has been set up to co-ordinate political activities – offering space for those who are in parties and the majority who are not to discuss and co-operate. They have coalesced around five demands: keep Gezi as a park, sack the heads of the police force who led the crackdown, ban the use of tear gas, release all those arrested during the protests and end restrictions on the use of public spaces for political activity. The platform have called a demonstration for 4pm local (2pm Irish) tomorrow in Taksim Square. With the threat of forcible police eviction still hanging over the camp much depends on whether they can match last weekend’s numbers. Amnesty International Ireland is holding a rally in solidarity with the Turkish protestors at the Embassy of Turkey in Raglan Road, Dublin, on Wednesday at 1pm. Posted in Misc and tagged turkey at 5:48 pm on June 8, 2013 by Broadsheet.